The details change from year to year, but only slightly. Sometimes they fall from a balcony, sometimes a window, sometimes a roof. Sometimes they fall two stories, sometimes three or four. Sometimes they're airlifted to Sacred Heart Medical Center in Spokane, other times to Harborview in Seattle. The Greek letters vary — whether it's Phi Delta Theta or Phi Kappa Tau or Lambda Chi Alpha — but the broad strokes remain eerily similar. In the first few months of the year, a Washington State University student, up late partying at a fraternity or sorority house, tumbles from a high spot and gets seriously injured. Though most survive, months of physical therapy and sky-high medical bills follow. It's not an uncommon occurrence at universities, of course. The Atlantic just published an outrageous story about a Penn State student who died during a fraternity initiation after he fell down a flight of stairs and his fraternity brothers refused — for 12 hours — to call for help. But serious falls have happened so often at Washington State University that the Inlander decided to tally all of the reported occurrences of WSU falls we could find. In just a few hours of research, we found 30 falls tied to WSU in the past 21 years — half of those since 2012. And we're absolutely certain we missed a few. This year, the father of a WSU student who lapsed into a coma after falling from a dorm window has turned to activism, demanding that WSU add safety features to dorm windows to prevent future falls. He launched the website "Fix the Windows" to try to spur change. Indeed, WSU is hiring a safety consultant to see what can be done to improve the safety of the campus windows, while still allowing students to be able to exit in the event of a fire. But WSU spokesman Phil Weiler points out that since 2000, only five falls have occurred on WSU-controlled property itself — and only four were accidental. Most falls happen off campus, especially in fraternities and sororities. "We don’t have the authority to go into a fraternity or sorority," Weiler says. "We don’t have the ability to manage the property." Indeed, windows aren't the biggest common denominator in the WSU student falls. Alcohol consumption is. For decades, Washington State University administrators have been trying to shed the university's party-school reputation. "Incoming freshmen have a skewed perspective for what's considered normal alcohol consumption practice on campus," Weiler says. Orientation programs are intended to try to fix that. But WSU has been trying to combat underage alcohol consumption and student binge drinking for a long time — and it's hard to see clear signs of progress. As additional falls happen on campus, we'll update the tracker. Washington State University student Aaron Iverson is on a spring break vacation in Honolulu with several of his Sigma Phi Epsilon fraternity brothers when he falls from a hotel balcony to his death. Shortly after a riot on campus over a ban on on-campus drinking, a 20-year-old student falls from a window of the second-story deck of a Sigma Nu fraternity, fracturing his skull and causing subdural bleeding. A drunk WSU student falls from a fifth-floor balcony, resulting in a head injury. Later, a student who had consumed "eight to 10 beers" falls from the second-story window at Phi Delta Theta, receiving injuries to his face and knees. That same year, a packed balcony collapses, sending six partying WSU students to the hospital. In September, WSU freshman Drew Wilkie falls 25 feet from a Phi Sigma Kappa fraternity house window. He ends up at Deaconess Medical Center in critical condition. Ryan Mallory, an 18-year-old WSU student, falls at least 45 feet from the third-floor balcony at Streit Hall. He's flown to Harborview's intensive care unit for treatment. According to WSU, a student jumping on a bed on campus slipped and fell out the window. A drunk 21-year-old female WSU student falls 10 feet from a fire escape balcony at the Sigma Kappa Sorority house. She's unconscious when she's found at 1 am beneath the balcony. Eventually, she's flown to Harborview Medical Center in Seattle and treated for possible neck fractures. “Unfortunately, we get these every year,” Pullman Police Commander Chris Tennant says, according to the Spokesman-Review. In September, a WSU student falls from the fire escape of the Theta Zi house. The fall was not alcohol-related. In October, a WSU student slips on the Phi Kappa Tau fraternity roof around 2 am, and falls three stories. Stuart Robertson, a 21-year-old WSU senior, plunges 40 feet off a cliff next to the Moscow-Pullman highway after leaving a party. An autopsy reveals that he was intoxicated. In November of that year, a 20-year-old male WSU student falls three stories out of a window at Alpha Kappa Lambda fraternity, landing on the windshield of a parked Ford Explorer. He is hospitalized. According to WSU, another incident occurred when students were roughhousing on a balcony, and one fell over the railing. Two students fall out of fraternity windows at the University of Idaho the same year. Chad Heffelfinger, a 20-year-old WSU student drunk on "jungle juice," falls from a 23-foot retaining wall, breaking every bone in his face. His face operated on twice. Nine metal plates are inserted into his head. WSU senior Ben Kappler is airlifted to Sacred Heart Medical Center in Spokane after being found at the bottom of the stairs behind the WSU library, apparently having been injured in a fall. 22-year-old Jonathan Meyer, an intoxicated WSU student, falls three stories from the Boulder Creek Apartment balcony after trying, unsuccessfully, to leap to a lower balcony. He's found unconscious, and is flown to Spokane to be treated by a neurosurgeon. That same month, a 19-year-old student falls from the third-story window at the Phi Kappa Tau fraternity house. And then a third student topples backward off a second-floor railing at the Lambda Chi Alpha house. He lands near rocks and a retaining wall, unconscious but breathing. He undergoes brain surgery and needs to be put into a medically induced coma while he recovers. In October, a 22-year-old WSU student jumps out a window in Orton Hall. Despite falling 11 stories, his descent is broken by trees, and he survives. In this rare case, alcohol did not appear to be a factor. The semester also results in the alcohol poisoning death of Kenny Hummel, an 18-year-old WSU freshman, and two falls at the nearby University of Idaho. Anthony Pentecost, a 21-year-old WSU student drunk on wine, tumbles down a flight of stairs at the Delta Chi frat house. That same year, a woman falls through a fire escape at Phi Kappa Tau. 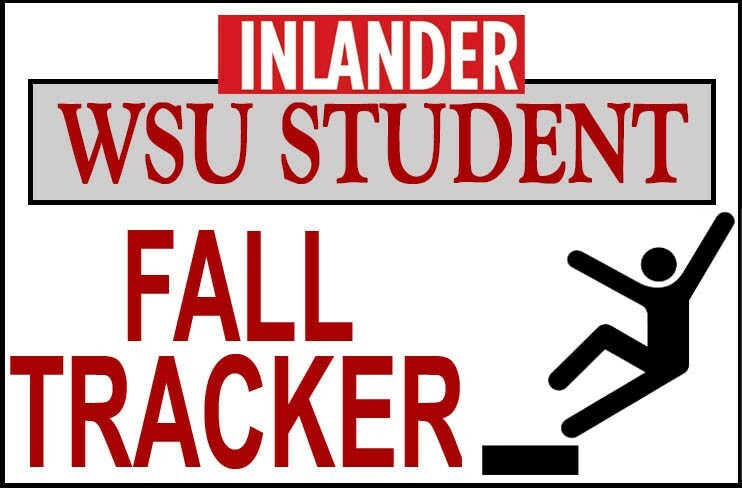 According to WSU, an additional fall occurred on campus when a student fell from a first-story window. A 20-year-old female WSU student, vomiting out of a second-floor window at the Delta Gamma sorority house, loses her balance and falls 15 feet to the concrete below. According to the Pullman police department, another 20-year-old female fell from the second-story window of a home off-campus as well. A 20-year-old male student, highly intoxicated, falls three stories off the Sigma Phi Epsilon fire escape. Vomit is found on his body. He's sent to Spokane with serious injuries. A 19-year-old female student falls from a third-floor WSU Campus Commons apartment balcony. She's taken to Pullman Regional hospital with internal injuries, then transferred to a hospital in Spokane. In August, a 22-year-old North Idaho man falls 30 feet from the top of the Kappa Delta sorority roof. He's not a WSU student. In September, a 19-year-old WSU student falls from a balcony, lands in a seated position, and later requests a ride to the hospital, according to the Spokesman-Review. In October, Nathan Hopkins, an 18-year-old student from Davenport, Washington, tries to stand on a bench while intoxicated, and ends up falling off the second story of a house. He's airlifted to Spokane. In November, WSU student-run Greek councils place a moratorium on all alcohol-related events as a result. In August, an 18-year-old WSU student falls out the window at Duncan Dunn Hall around 2 am. He's flown to Sacred Heart Hospital in Spokane.